The SmartRayVision DR X-Ray system is now the only DR X-Ray system to be approved for EOD use by NSWC IHEODTD, Indian Head, Maryland. Stevensville, MD (October 2, 2017) – The Army awarded its Field Portable Radiographic System purchase to Federal Resources for 140 SmartRayVision Extreme Systems made by SharpLogixx, LLC in Green Bay, Wisconsin. A portable X-Ray system used to view and verify the contents of suspicious items that may be improvised explosive devices (IEDs) was recently selected for use by the U.S. Army and approved for Explosive Ordnance Disposal (EOD) use (AEODU) by Naval Surface Warfare Command (NSWC), Indian Head EOD Technology Division (IHEODTD), Indian Head, Maryland. In June 2016, Army Contracting Command, New Jersey (ACC-NJ) began conducting market research, on behalf of the Office of Program Management, Close Combat Systems (OPM-CCS). The objective was to seek information from industry regarding currently available devices and technologies that could be procured to address an immediate need for a Field Portable Radiographic System to support diagnostics/disposal of Unexploded Ordnance (UXO) and Improvised Explosive Devices (IED’s). 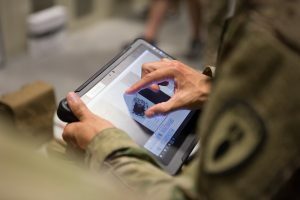 In the fall of 2016, the Army performed an evaluation of several companies’ portable X-Ray systems including the SmartRayVision Systems. The Army purchased multiple systems from each company to conduct a full and comprehensive evaluation. The result of that evaluation was the selection of the SmartRayVision System, in March 2017. SharpLogixx, the manufacturer of the SmartRayVision portable X-Ray systems, and Federal Resources delivered all 140 systems to the U.S. Army in May of 2017 for fielding to Army EOD units around the world. After additional testing and review, in September 2017, the SmartRayVision DR X-Ray system is now the only DR X-Ray system to be approved for EOD use by NSWC IHEODTD, Indian Head, Maryland. Federal Resources EOD solutions will be on display at AUSA in Washington DC between October 9-11, 2017 at booth 7153. For more information contact Aaron Poynton at Aaron.Poynton@FederalResources.com. Founded in 1986, Federal Resources is a leading provider of quality products and mission-critical solutions that support the U.S. Military, Federal Government, State/Local Responders, and International Markets. Specializing in comprehensive life-cycle sustainment solutions; procurement and acquisition; technical services and asset management; and training expertise, the organization is dedicated to serving its diverse range of well-established and emerging market segments. Federal Resources strives to fulfill and expand upon its mission to ensure end-users are equipped with the most innovative, reliable, and cost-effective products and technologies available on the market. For more information, visit Federal Resources. Headquartered in downtown Green Bay, Wisconsin, SmartRayVision™ products represent best-in-class X-Ray solutions and innovative software technology that works quickly and reliably. SmartRayVision products help bomb techs look through the dangerous unknowns to see even the smallest threats clearly, plus see detail not typically visible. The products are made in the USA to ensure customers receive reliability, high-quality performance, and attentive service. Manufacturing on American soil lets SmartRayVision work with agility and flexibility, pursuing cutting-edge innovation as fast as technology evolves, and exploring special customer requests with speed-to-market quickness. For more information, visit SmartRayVision.